22-this row is a combination of herringbone stitch and detached twisted chain stitch. 23- this row is worked in closed buttonhole stitch, twisted chain stitch and a set of five detached chain stitches. 24- variations of detached chain stitches. 25- I made some shapes with herringbone, chevron, feather and buttonhole stitches and worked the detached chain stitches on them. 26- I tried detached chain stitches on lace. 27-detached chain stitches are worked on beads and sequins. Bad choice of sequin. A darker colour would have looked better. 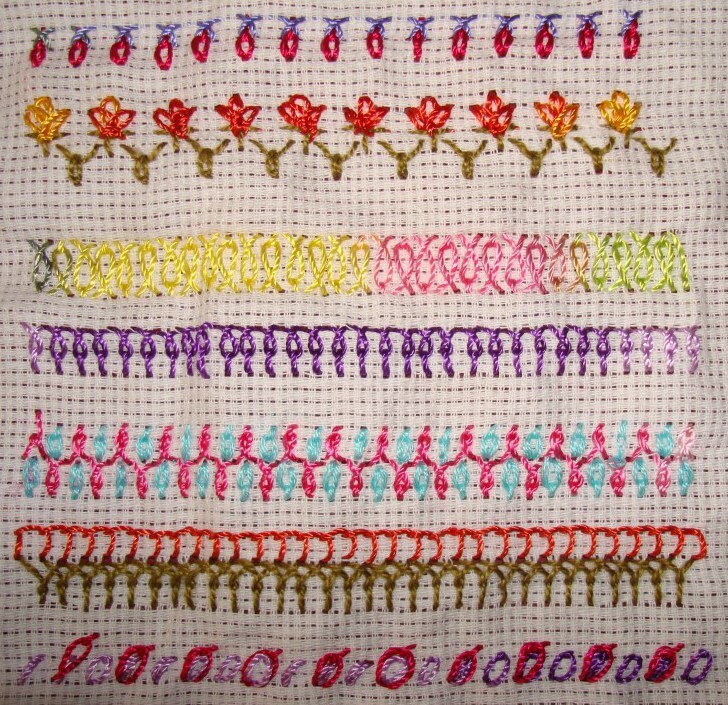 With these variations I am completing this detached chain stitch sampler. Waiting for next week’s stitch and enjoying the works done by other members of this challenge. Today also I tried few variations of detached chain stitch on my stitch sampler. Found some more possibilities for twisted chain stitch. 15- combination of detached chain and detached double chain or berry stitch. 16-detached twisted chain worked horizontally in this row. 17-detached twisted chain stitch worked diagonally in this row. 18- detached twisted chain stitch is worked [I was trying to do this as paisley pattern, was not very successful though!] over fly stitch variation. 19-this is the first step – a row of detached chain stitches. I worked a slanted Cretan stitchover these detached chain stitches. Again worked detached chain stitches to fill the spaces. 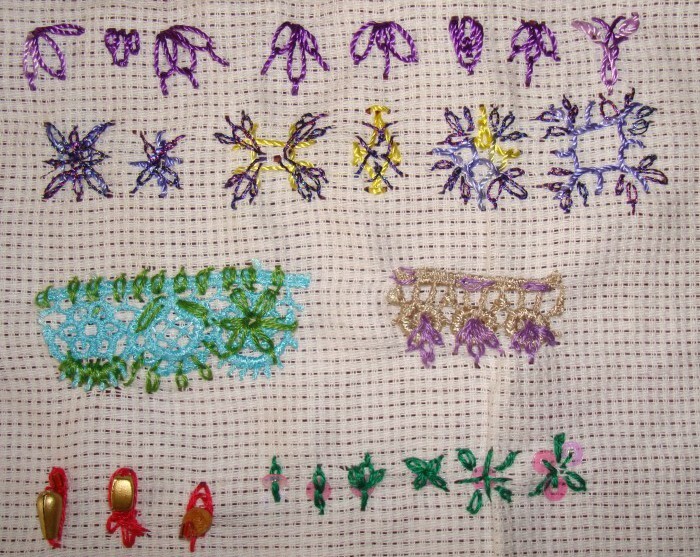 20-worked individual fly stitches in a row and worked detached chain stitches on alternate stitches. 21- detached double chain stitches with running stitches. God willing, hoping to finish this sampler by tomorrow. 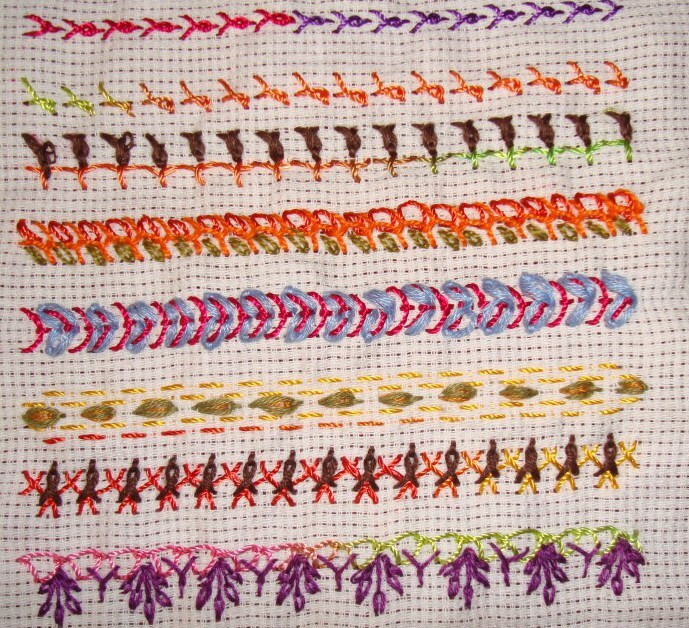 The progress of this week’s detached chain stitch of the TAST2012 stitch challenge by SharonB, is quite slow. 11- the detached twisted chain stitch and its reverse are worked together in a row. 12-in this row detached twisted chain stitches are worked with longer tail. Detached chain stitches are worked in between the stitches. 14- a row of crossed detached twisted chain stitches are worked along with buttonhole stitch. I was thinking how to use this stitch as a band sampler. I am not getting too many ideas though! Not necessarily take the documented variations that are in various stitch dictionaries but take the stitch itself and see what you can do with it. I am not saying working variations is wrong as some variations will appear as part of the challenge later in the year. This is a gentle ‘keep it simple’ reminder that the challenge is to take a stitch and see what can be done with it. 4- worked back stitches in a row, did detached chain in green thread, did three detached chains in dark blue thread. Then added pink seed beads, and worked a detached chain around it too. I am really trying! changed the thread half way and did the whipping with cone thread. 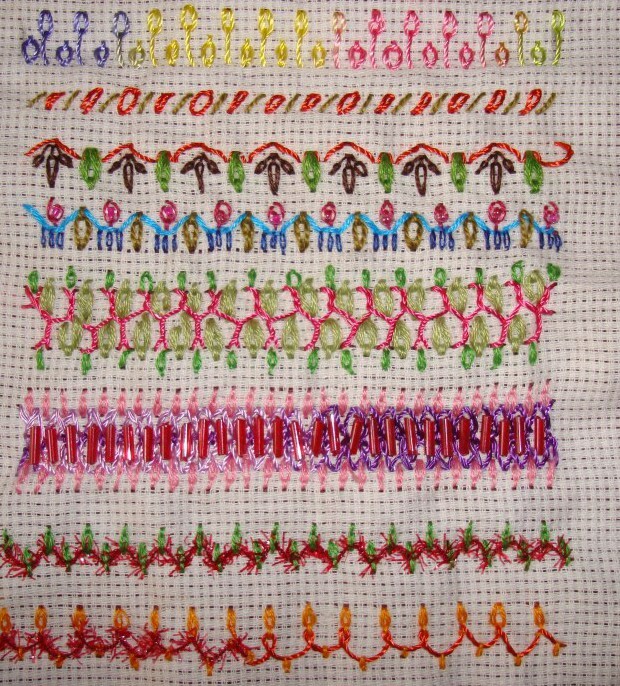 9 worked individual cross stitches , then long tailed detached chain stitches below them. Worked a set of three detached chain stitches over them. It does looks good. That’s a surprise! hoping to stumble on sone new variations tomorrow…. 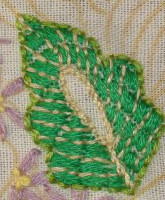 This week’s stitch of the TAST 2012 stitch challenge by SharonB is detached chain stitch. When this challenge was rerun on stitchin fingers, I did some motifs with this stitch. 1- A row -Alternating between normal detached chain and long tailed detached chain. 2- A row of straight stitch and detached chain. 3- A variation og zigzag back stitch, with single chain and triple chain stitches. 5.I saw this twisted variation of herringbone stitch by one of the members of this challenge. The detached chain stitches are worked on that twisted herringbone stitch. hoping to continue the variations.